A young Cambodian returns home. A diamond shipment goes missing. A foreign assassin arrives in Phnom Penh. And then there's the chocolate - lots of it. Phirun is determined to make it as Cambodia's first chocolate chef. But things don't go quite as plannned when he gets unwittingly caught up in a deadly turf war between rivalling diamond mafia and those who are after him. Falling in love with a mysterious Khmer-Australian doesn't help him. Throw in an overzealous post-9/11 American intelligence officer and a corrupt Belgian ex-Colonel, from Tel Aviv through Belgium and Bangkok right up to Phnom Penh - in this fast read of crime and intrigue, chocolates have never tasted so good! I love travelling, and I love mystery writing, so whenever I'm abroad I like to dip into the local genre where I can, even collecting books from the places I've travelled. Ahead of three weeks in Thailand, Cambodia and Vietnam a few years ago I'd looked up some possibilities ahead of time, so I knew what to look for in the bookshops. Landing in Bangkok, I grabbed some John Burdett thrillers (his Sonchai Jitpleecheep series is excellent) and this then-new Cambodian-set crime novel. 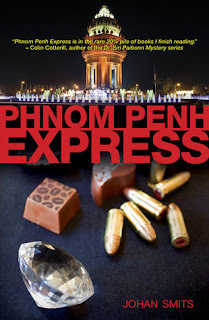 Written by a Belgian expat who'd spent years in Cambodia, PHNOM PENH EXPRESS is not your typical southeast Asian crime novel (not that they're all homogenous of course - far from it - but this one has some particularly unique flourishes). An international thriller with a chocolatier at its heart. Phirun has a dream. Half Cambodian and half Belgian, he wants to combine his heritages by making it as Cambodia's first chocolate chef. But his plans go awry when a shipment of chocolates containing diamonds is mistakenly delivered to his chocolate shop in Phnom Penh. That's just the first misstep in what becomes a dangerous and slightly madcap dive into the world of international diamond smuggling. Rival 'diamond mafia' in the middle of a turf war zero in. Rather than dealing with customers who he makes happy with his chocolate creations, Phirun is faced with a far nastier and less forgiving world full of diamond smugglers, arms traders, and professional assassins. As the same time, he gets romantically entangled with an intriguing Khmer-Australian. Danger and humor mix throughout PHNOM PENH EXPRESS. Smits, a Belgian who has spent years in Cambodia, gives his hero that same ‘insider-outsider’ perspective and takes readers on a journey through modern Phnom Penh in all its fragrant glory and grime. This is a solid read; a rather straightforward story and writing style that’s boosted by the vivid setting, unusual characters and events, and a vein of sardonic humour. When I read the book it suffered a little from comparison with Burdett's Bangkok thrillers (which provide a similarly vivid insight into a southeast Asian city while having stronger characters, deeper issues, and crackling prose), but PHNOM PENH EXPRESS still has something to offer too and is worth a look. Smits gives readers a sensory experience of Phnom Penh, from the pervasive aroma of fermented fish to the karaoke soundtrack beloved by citizens. The situation is a little surreal, and there's some lovely wry humour in what can at times seem a bit of a madcap story, careening around the globe. All centred on a local guy who just wants to make chocolates. A good beach read.